The last time I saw “Shakespeare (Abridged)” there was literally no budget; three Wright State students produced it in their Student Director’s Lab. It was uproarious, even though I had only a basic working knowledge of Shakespeare’s work, because of the energy in the room. These three had a comic chemistry – since they were all good friends – that made everything they did funny even when I didn’t get the joke. Fast forward a few years. I’ve seen more of Shakespeare’s plays (thanks to the fine work at Cincinnati Shakespeare Company) and understand it somewhat better (but not nearly as much as I should). CSC’s version has a budget, three fine actors, and that same comic energy. “The Complete Works of William Shakespeare (Abridged)” is a madcap, fast paced often-juvenile look at all 38 of the Bard’s plays including the sonnets. There’s room in the script for a little improv and updated pop culture references and director Sara Clark does a nice job keeping things moving along while maintaining the hilarity throughout. Jeremy Dubin, last seen in “Private Lives,” is the master of ceremonies and his presence gives the show the right vibe. You know what you’re in for from the outset of his introduction. Then Nick Rose shows up; he’s one of CSC’s long time “serious” actors – but his snark is as strong as anyone’s. And then you have my favorite, the unstoppable Justin McCombs, who is as comfortable wearing a wig and a dress as he is bounding out of the audience pretending to be “one of us.” If there’s a more consistently funny comedian on Cincinnati stages I don’t know who it is. There were times when the actors were mugging maybe a little too much and a few lines were stumbled over. But the audience interaction when a regular patron ruined a joke more than made up for the small mistakes. This is a great summer time night out at the theatre and even if you aren’t a Shakespearian expert I think you’ll enjoy yourself. 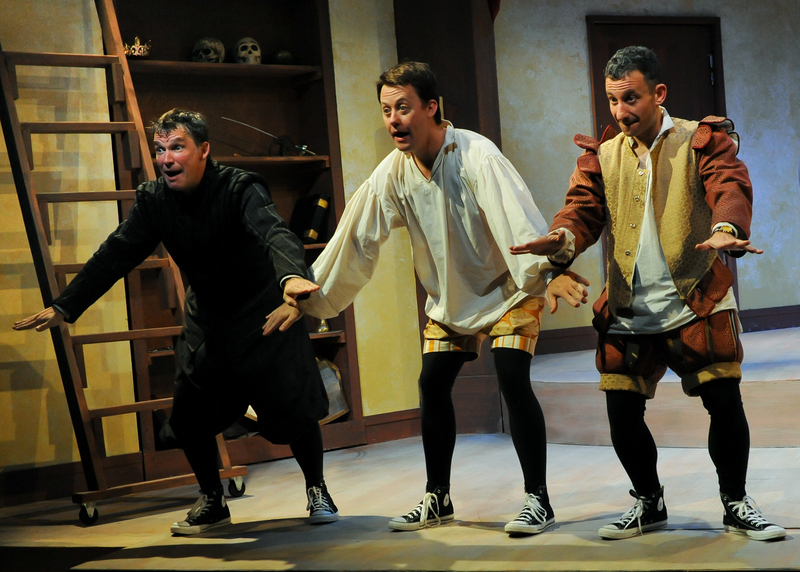 THE COMPLETE WORKS OF WILLIAM SHAKESPEARE (ABRIDGED) runs through August 16th at Cincinnati Shakespeare Company in downtown Cincinnati. For more information or to order tickets, click here.